The structure will remain in its mountain location for two years "reflecting and interacting with the mountain landscape over the changing seasons". "Right now it's completely minimal, removed of all colour and definition. It's a whiteout, covered in a blanket of snow right now," Aitken told Dezeen. "The viewer can come back to the piece as the seasons are changing, in fall in a storm or in the summer when it's a green pasture. As our lives change the artwork is shifting with us." The structure is modelled on the Californian ranch houses developed in the 1920s and 1930s that incorporated the ideas of modernist architect Frank Lloyd Wright with the traditional ranch houses of the American West. 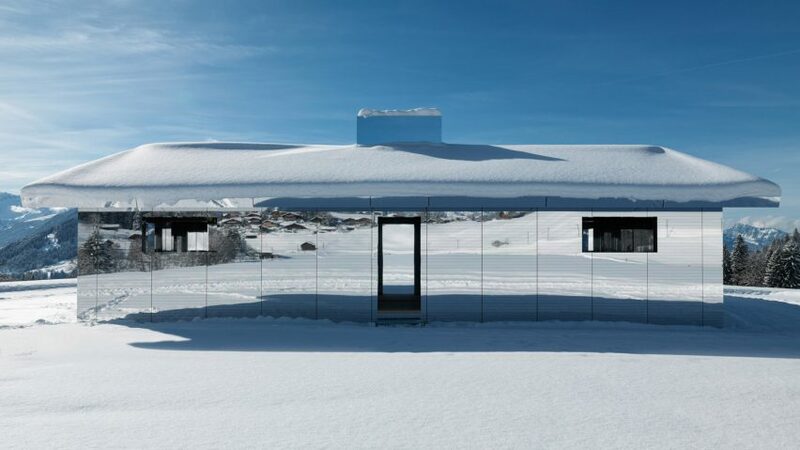 According to Aitken the "utterly generic" style is familiar as the archetypal 20th-century suburban house in the US.For this installation he decided to "embrace the banal as opposed to looking at the regional as exotic," by installing the same style of house in the Alps. "The work really is the sum of the landscape around it. When you think of art you often think of something much more solid, but Mirage moves in an autonomous way," explained Aitken. "It changes in an almost chameleon-like form."